Why is rehabilitation so important for recovery? Rehabilitation services may be offered to people with existing conditions, or those who are taking a little longer to recover from hip replacement surgery. The main benefit of rehabilitation is that it educates and empowers people who have undergone hip replacement surgery to self-regulate their own rehabilitation, with access to a team of people for ongoing support and follow up. 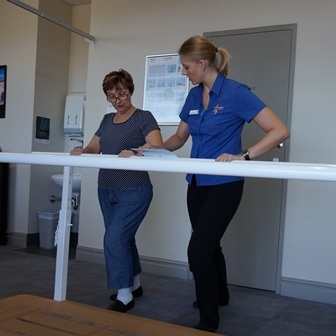 The Specialist Rehabilitation Service at St John of God Mount Lawley Hospital takes a multi-disciplinary approach to helping people regain full function, in partnership with the patient’s surgeon. Patients have access to an allied health team that covers a variety of specialties including physiotherapy, occupational therapy, social workers, dieticians and clinical psychologists. Patients are educated and supported for when they return home, to make sure they don’t undertake any activities that may jeopardise them post operatively. They will need to learn new ways to get dressed, safer ways to shower and toilet and how best to set up furniture in their house to protect their hip. Rehabilitation is individual and goal driven. The team, in collaboration with the surgeon, the patient and carers, will help develop individual goals for the patient to achieve before discharge. This can range from four days to two weeks. The Specialist Rehabilitation Service is the first of its kind in Western Australia and is the only accredited private rehabilitation service in the State. It caters to both inpatient and ambulatory patients. The service is staffed by a multidisciplinary team to comply fully with the Australasian Faculty of Rehabilitation Medicine’s staffing requirements. With 41 beds – both single and shared – the service is equipped with gymnasium and treatment area, and a dining room. Activities include one-on-one gym sessions, group gym sessions and relaxation and education sessions. A hydrotherapy pool is also onsite. Referral to the service can be arranged through a GP or specialist, and will be assessed by a Referral Coordinator for suitability or the program.